Nicholas King, “Nicholas King,” Histories of the National Mall, accessed April 23, 2019, http://mallhistory.org/items/show/96. 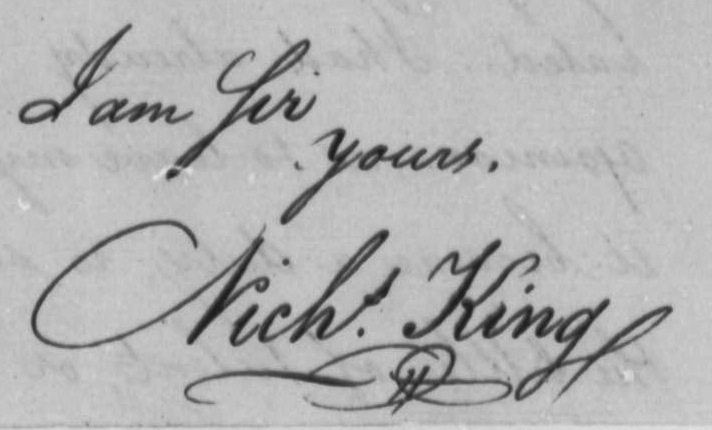 Nicholas King worked as a surveyor for the Board of Commissioners of Washington from 1796 to 1797. Named the Surveyor for the City of Washington in June 1803, he served in that position until his death in May 1812. In 1804, King helped to measure and record the first meridian in the US in Washington. At President Thomas Jefferson's request, he placed a marker along this imaginary line of longitude on the Mall, in a spot west and north of where the Washington Monument stands today. The Thomas Jefferson Papers, Library of Congress. View original document. Born the son of a surveyor, Nicholas King studied his father's trade. After practicing as a surveyor and engineer in England for over five years, he moved to the United States, arriving in New York in early 1794. King soon headed south to the then-capital of the United States, Philadelphia, where he found work as a surveyor. His job was briefly suspended when he was involuntarily drafted as a member of the Philadelphia militia during the Whiskey Rebellion. In 1796, Pennsylvania Senator Robert Morris sent King to the area which was to become Washington City to help William Tunnicliff survey Morris' property there. Once there, King was also hired by the Board of Commissioners as a surveyor for the city, although he resigned in 1797 so his father could take the position. The younger King continued to work in Washington, producing a set of wharfing plans for the city and helping landowners petition against changes made to the city plan. He also drew some informal sketches which are among the earliest drawings of Washington DC. In 1802, Nicholas King was offered the job of Surveyor of the City, although his official appointment was not made until 1803. In this capacity he helped survey the prime meridian of the United States and produced a complicated map of Washington City. He also drew a number of maps of the western territories, working off of notes and rough sketches from exploring parties, including the Lewis and Clark expedition. King was still in office when he died in 1812.